It would seem that rather than the thousands of demonstrators anticipated, only a few hundred turned up in Bradford's Centenary Square this afternoon to protest against the making and screening of the film 'Innocence of Muslims'. 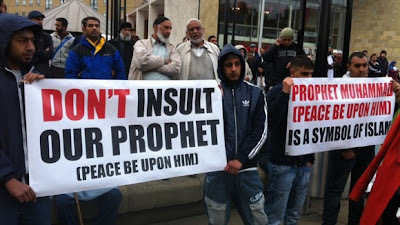 This does credit to those who were not lured into this pointless demonstration against freedom of expression by the Bradford Council for Mosques. However, is it not striking that in the video below, the speakers address the crowd not in English, but in Urdu? Could there be any clearer demonstration that they are not part of our society, given that they share neither our values nor even our language? The protest appears to have been peaceful, but caused some disruption to local bus services.